Looking for a creative activity that's both fun and tasty? You have to try these crafts made from none other than candy! Kids especially love these tasty creations. The following list of candy projects will inspire you to bring the crafting to your kitchen–find a variety of both holiday and everyday crafts. So, grab some candy and start experimenting! You'll love the results. Just be sure to share the results proudly with your friends and family before gobbling them up. 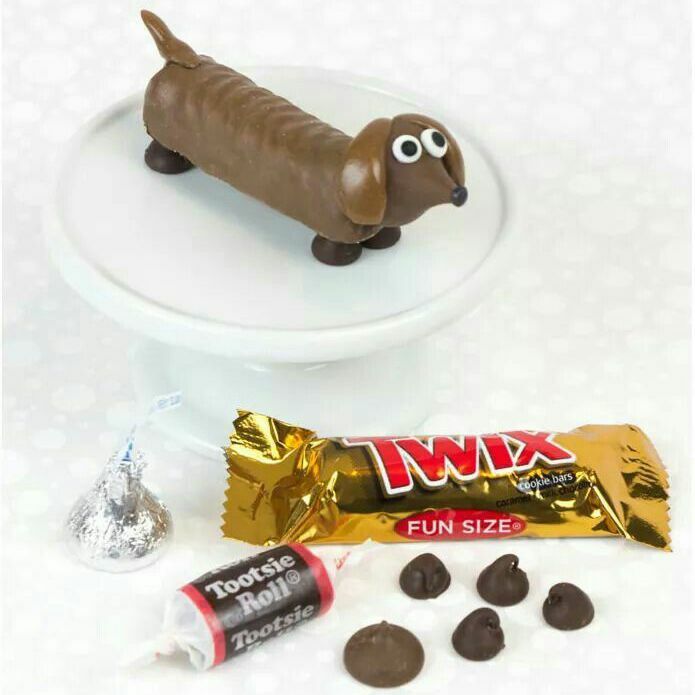 Discover how you can use candy bars, Hershey's Kisses, and chocolate chips to make this adorable pup. What child wouldn't love to have these canines as birthday party favors? Are you a room mom or someone who hosts a lot of children's parties? Make these sweet oatmeal flower pot cookies for your next event and watch your children smile. The tutorial demonstrates how to make four different types of candy flowers to adorn your oatmeal cookie flower pot. Almost everyone knows about gingerbread houses for the Christmas season, but this house has a bit of a twist. Build a house with Kit Kat candy as its base then decorate with marshmallows, gumdrops, and other confections. Not everyone loves gingerbread, so this is an alternative that is sure to please most candy lovers. Have some fun with your kids making toy vehicles from sugar cookies, pretzels, and Rolo candy. They are so simple to make and look adorable. Your children will want to play with their "trucks" before eating them! Are you the type of person who loves to be creative but you just weren't born with the crafting gene? Well, with this craft, anyone can create Pinterest-perfect projects! You stick the candy pieces together with the help of a heated knife. That's it! You now have instant, simple holiday candy decorations that would look great on a cake, or just placed on a plate. Bowl made of peppermint candies. Why not give your friends, co-workers, and teachers a cute bowl made from peppermint candies. Peppermint candies can be softened in an oven and molded into bowl shapes in as little as twenty minutes. Fill the bowl with other candies, wrap with cellophane and tie with a ribbon. You now have a handmade inexpensive gift that is suitable for anyone. These cute, white chocolate mermaid tails are easy to make, and they are great to use as a party decoration or favor. Luster dust gives them a metallic finish that completes the "underwater" look. What an unusual and delicious candy treat! They would make a great party favor for a Little Mermaid themed birthday party. Celebrate Christmas with a mid-century inspired candy wreath cake. Make a bundt cake from cake mix and then frost and decorate with round candies. The authors compare this cake wreath to a gingerbread house. They recommend that you first pick off and eat the candy, then slice the cake and serve. Whatever way you choose to eat it, we think that this candy wreath would look lovely adorning your Christmas table. Lollipop ghosts are a classic Halloween craft which remains as popular today as they were twenty years ago. This is a craft that even little ones can make successfully. Gather the kids around the craft table and show them how to make little ghosts out of a sucker, a Kleenex or piece of cloth, and coordinating black and orange ribbons. This Easter, give your guests the cutest carrot-colored cone-shaped chocolate cups filled with jelly beans or other delectable treats. Although this project was made for Easter, you could actually make the chocolate cones in other colors depending on the occasion or holiday.